A day later, it still felt unreal to Bruce Arians. All of it. Since 1967, Arians has played high school and college football, then coached college and pro football … 48 years altogether … and on Sunday morning in Arizona, he considered this question: Of all the games you’ve ever played and coached, where does Saturday night’s overtime win over Green Bay rank? Forty-eight years now. Keep that in mind. Coaching under Bear Bryant, coaching Peyton Manning and Ben Roethlisberger and Andrew Luck and now Carson Palmer and Larry Fitzgerald—14 coaching jobs in all. “That probably was the most dramatic up-and-down, end-to-end game and finish of my life,” Arians said. “We stop ’em on fourth down. Game over. Nope. We got ’em fourth-and-20 way back at the goal line. Game over. Nope. We blew that one. Then they throw a Hail Mary on the last play of the fourth quarter and we get good pressure. Game over. Nope. For the first time in their 56 seasons of existence, the Patriots and Chiefs squared off in a postseason matchup (they had been the only two of the original eight AFL franchises that never met in the postseason). And it was New England that came away victorious, defeating Kansas City, 27-20, to advance to the AFC Championship Game next week. The Patriots scored a touchdown in each of the first three quarters, including two touchdown passes from Tom Brady to Rob Gronkowski. Gronkowski, who had a TD reception in each of the Patriots’ three postseason wins last year, is the first tight end in NFL history with a touchdown reception in at least four consecutive postseason games. His career total of eight receiving TDs in the postseason is also tops among all tight ends in league history, surpassing Dave Casper and Vernon Davis, who each had seven. Tom Brady, who completed 28 passes for 302 yards, was hard at work right out of the gate for the Patriots. Brady led an 11-play touchdown drive on New England’s opening possession, and all 11 plays were pass attempts (he had eight completions, capped by Gronkowski’s touchdown). The last team before New England to score a touchdown in a postseason game on a drive of at least 11 plays – all passes – was the Falcons in December 1995 at Green Bay. Atlanta had an 11-play touchdown drive spanning the third and fourth quarters; Jeff George went 9-for-11 on the drive, including a 27-yard TD pass to J.J. Birden. That opening drive was a sign of things to come for the Patriots, as New England passed on 75 percent of their plays from scrimmage – not to mention that four of their 16 rushing attempts were kneeldowns by Brady. Only three other teams won a postseason game with pass plays accounting for at least 75 percent of their plays. New England did so last year in a divisional-round victory over the Ravens (80 percent), as did the Rams (78 percent in Super Bowl XXXIV against the Titans) and the Packers (76 percent in Super Bowl XLV versus the Steelers). It was also a pass-happy day for the Chiefs in a losing effort with Alex Smith throwing 50 passes, completing 29 for 246 yards. Smith’s yardage total is the third-lowest in NFL postseason history for a quarterback with at least 50 pass attempts. The top two on that list are Jay Schroeder, who had 195 yards on 50 attempts for the Redskins in a loss to the Giants in January 1987, and Drew Bledsoe, who threw for 235 yards on 50 attempts in New England’s loss at Cleveland in January 1995. Bill Belichick was also on the opposing sidelines for both of those games – he was defensive coordinator for the Giants versus Schroeder and the Redskins and head coach of the Browns against Bledsoe and the Patriots. It looked like another miracle comeback was in the cards for the Packers after Aaron Rodgers completed a 41-yard touchdown pass to Jeff Janis at the end of regulation to force overtime. 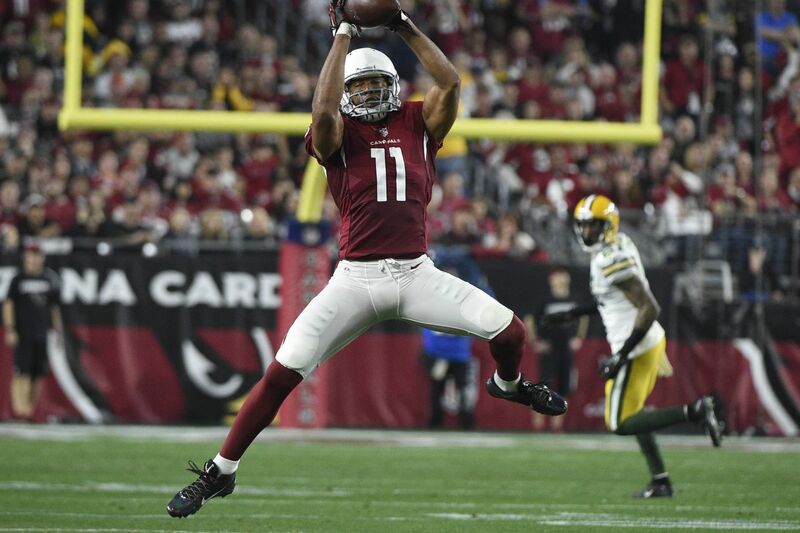 Larry Fitzgerald and the Cardinals had other plans – the longtime Cardinals receiver had a 75-yard reception to start overtime and, two plays later, crossed the goal line after catching a screen pass from Carson Palmer to give Arizona a 26-20 victory over Green Bay. The game-winning score was Fitzgerald’s 10th touchdown reception in just eight postseason games. No other player in NFL history had at least 10 touchdown catches in their first eight postseason games. The previous fastest to 10 TD receptions in the postseason was Jerry Rice, who scored his 10th receiving TD in his ninth postseason game. The overtime loss was a bitter blow for the Packers, who drove 86 yards with no timeouts in less than two minutes to conclude the fourth quarter. The touchdown pass by Rodgers to Janis to complete the drive marked the first game-tying or game-winning passing touchdown at the end of regulation in NFL postseason history. The Packers have lost their last five postseason games that required overtime, which now stands as the longest losing streak of its kind in NFL postseason history. Green Bay had been tied with the Colts, who have lost their last four postseason games that required overtime. Aaron Rodgers has yet to register an overtime win in his NFL career – with Rodgers under center, the Packers are 0-4 in regular season overtime games and 0-3 in the postseason. The Panthers started fast, built a 31-0 halftime lead, and held off the Seahawks’ bold comeback to advance to the NFC Championship Game with a 31-24 victory over Seattle. 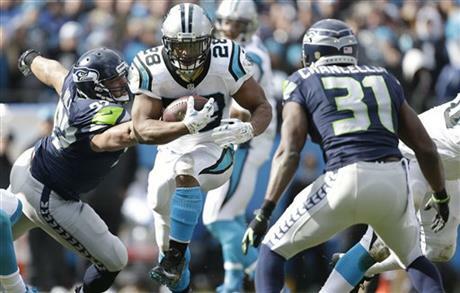 Jonathan Stewart opened the game with a 59-yard run that set up Carolina’s first score. During the expansion era, only two other players ran for 50 yards or longer on the first play from scrimmage of a postseason game: Ray Rice, 83 yards for Baltimore against New England; and Tim Hightower, 70 yards for Arizona against New Orleans. They did it six days apart in January 2010. The Panthers’ 31-point lead was the third largest in a first-half shutout in an NFL playoff game. Oakland led the Houston Oilers, 35-0, at halftime of a 56-7 victory in 1969; and the Giants led the Vikings, 34-0, at intermission in the 2000 NFC Championship Game (Jan. 2001). – Chargers 41, Dolphins 38 (Jan. 1982): San Diego led, 24-0, after 15 minutes. But Don Strock replaced David Woodley at quarterback and by early in the third quarter, Miami had tied the game. Strock passed for 403 yards and four touchdowns, but the Chargers prevailed in overtime after each team’s kicker missed a short field-goal attempt in the extra period. Dan Fouts passed for 433 yards, including 13 completions to Kellen Winslow. – Bills 41, Oilers 38 (Jan. 1993): Frank Reich, subbing for injured Jim Kelly, led Buffalo to the greatest playoff comeback in NFL history. The Bills trailed 35-3 in the third quarter, actually led late in regulation time, and won the game in overtime on Steve Christie’s field goal after Nate Odomes picked off Warren Moon. – 49ers 39, Giants 38 (Jan. 2003): The 49ers trailed, 38-14, late in the third quarter, after Amani Toomer had caught three TD passes from Kerry Collins. But in the game’s last 18 minutes, Jeff Garcia threw two TD passes and ran for another score. Still, the Giants had a chance to win the game but botched the snap on a 41-yard field-goal attempt as time expired. It wouldn’t be Elias Says without a bit of pure trivia, right? Cam Newton carried the ball 11 times on Sunday but netted only 3 yards. He became the seventh player with less than 10 yards on more than 10 carries in an NFL playoff game. Among the others were Cecil Isbell, better known for throwing more TD passes than anyone else to Hall of Famer Don Hutson, for the Packers in 1941; and Barry Sanders, who was held to minus-1 yard on 13 carries by the Packers in 1994. When it mattered most, Denver drove 65 yards on 13 plays for its only touchdown of the game. C.J. 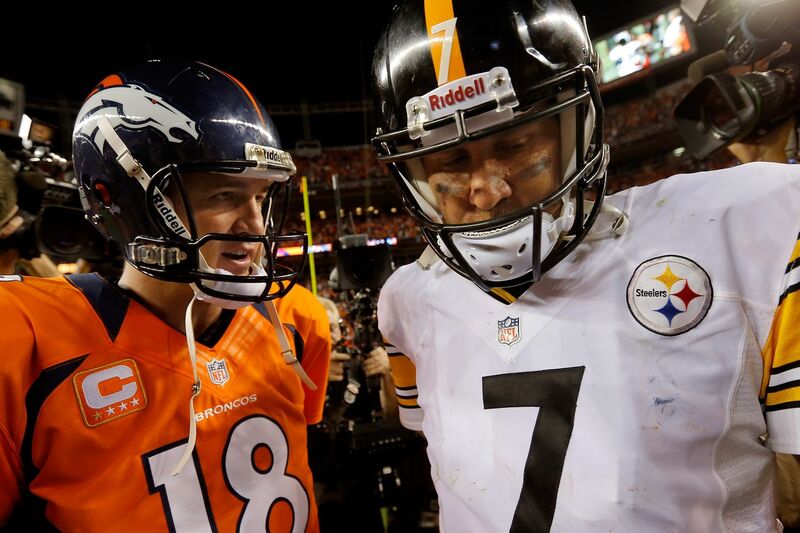 Anderson‘s 1-yard run with 3:00 to play was the winning score in the Broncos’ 23-13 victory over the Steelers. It also snapped Denver’s streak of 22 consecutive drives without a TD over its last two playoff games. That was the longest TD drought by any team over the last 10 postseasons. Peyton Manning became the third quarterback to start a postseason game at age 39 or older. The others were Phil Simms for the Giants following the 1993 season (a win against the Vikings and a loss to the 49ers), and Brett Favre for the Vikings following the 2009 season (a win over the Cowboys and a loss to the Saints). Pittsburgh played without Antonio Brown and DeAngelo Williams on Sunday. It was only the second postseason game in NFL history in which a team was missing its leaders in rushing yards and receiving yards-that is, two different players-from the preceding regular season. The only other such instance was the 1934 NFL Championship Game, in which the Giants hosted the Bears at New York’s Polo Grounds. The Giants prevailed despite playing without their rushing leader, Harry Newman, and their receiver leader, Red Badgro. Newman had suffered broken bones in his back in a game against the Bears in November; Badgro broke a leg in New York’s regular-season finale. That game lives in NFL lore as the “Sneakers Game,” in which the Giants overcame a 13-3 deficit by scoring 27 fourth-quarter points for a 30-13 win, ruining what would have been a perfect season for George Halas’ Bears, who went 13-0 during the regular season. The Giants were aided by a change of footwear. Having played the first half of the game on an icy field, several Giants players changed at halftime from football cleats to basketball shoes. The sneakers were borrowed from the Manhattan College locker room by Andy Cohen, a part-time Giants trainer who happened to work at the college and had a key to the storage room. In Antonio Brown‘s absence, wide receiver Martavis Bryant was a noteworthy performer for Pittsburgh, with a pair of long gains: a 40-yard run and a 52-yard pass reception. Only four other players had gains of 40 yards or longer on both a run and a reception in the same postseason game: Hugh McElhenny (49ers vs. Lions in 1957), Oscar Reed (Vikings vs. Redskins in 1973), Chuck Foreman (Vikings vs. Rams in 1976), and James Lofton (Packers vs. Cowboys in Jan. 1983). Bryant also had a 44-yard run against the Bengals in Pittsburgh’s Wild Card win a week ago. Five other players had runs of 40 yards or longer in consecutive postseason games, but all were running backs: Joe Cribbs, Marcus Allen, Merril Hoge, Terrell Davis, and Brian Westbrook.